Many approaches have been proposed to solve the problem of finding the optic flow field of an image sequence. Three major classes of optic flow computation techniques can discriminated (see for a good overview Beauchemin and Barron IBeauchemin19951): gradient based (or differential) methods; phase based (or frequency domain) methods; correlation based (or area) methods; feature point (or sparse data) tracking methods; In this chapter we compute the optic flow as a dense optic flow field with a multi scale differential method. The method, originally proposed by Florack and Nielsen [Florack1998a] is known as the Multiscale Optic Flow Constrain Equation (MOFCE). This is a scale space version of the well known computer vision implementation of the optic flow constraint equation, as originally proposed by Horn and Schunck [Horn1981]. This scale space variation, as usual, consists of the introduction of the aperture of the observation in the process. The application to stereo has been described by Maas et al. [Maas 1995a, Maas 1996a]. Of course, difficulties arise when structure emerges or disappears, such as with occlusion, cloud formation etc. Then knowledge is needed about the processes and objects involved. In this chapter we focus on the scale space approach to the local measurement of optic flow, as we may expect the visual front end to do. 17. 2 Motion detection with pairs of receptive fields As a biologically motivated start, we begin with discussing some neurophysiological findings in the visual system with respect to motion detection. 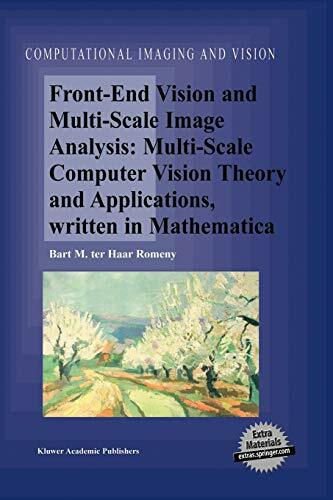 Front-End Vision and Multi-Scale Image Analysis. The purpose of this book. Scale-space theory is biologically motivated computer vision. This book has been written in Mathematica. Acknowledgements. 1: Apertures and the notion of scale. 2: Foundations of scale-space. 3: The Gaussian Kernel. 4: Gaussian derivatives. 5: Multi-scale derivatives: implementations. 6: Differential structure of images. 7: Natural limits on observations. 8: Differentiation and regulation. 9: The front-end visual system - the retina. 10: A scale-space model for the retinal sampling. 11: The front-end visual system LGN and cortex. 12: The front-end visual system - cortical columns. 13: Deep structure I. Watershed segmentation. 14: Deep structure II. Catastrophe theory. 15: Deep structure III. 16: Deblurring Gaussian blur. 17: Multi-scale optic flow. 18: Color differential structure. 19: Steerable kernels. 20: Scale-time. 21: Geometry-driven diffusion. 22: Epilog. A: Introduction to Mathematica. A.1. Quick overview of using Mathematica. A.2. Quick overview of the most useful commands. A.3. Pure functions. A.4. Pattern matching. A.5. Some special plot forms. A.6. A faster way to read binary 3-D data. A.7. What often goes wrong. A.8. Suggested reading. A.9. Web resources. B: The concept of convolution. B.1. Convolution. B.2. Convolution is a product in the Fourier domain. C: Installing the book and packages. C.1. Content. C.2. Installation for all systems. C.3. Viewing the book in the help browser. C.4. Sources of additional applications. D: First start with Mathematica: Tips and tricks. D.1. Evaluation. D.2. Images. D.3. Programming. D.4. 3-D. References. Index. Ter Haar Romeny, Bart M.